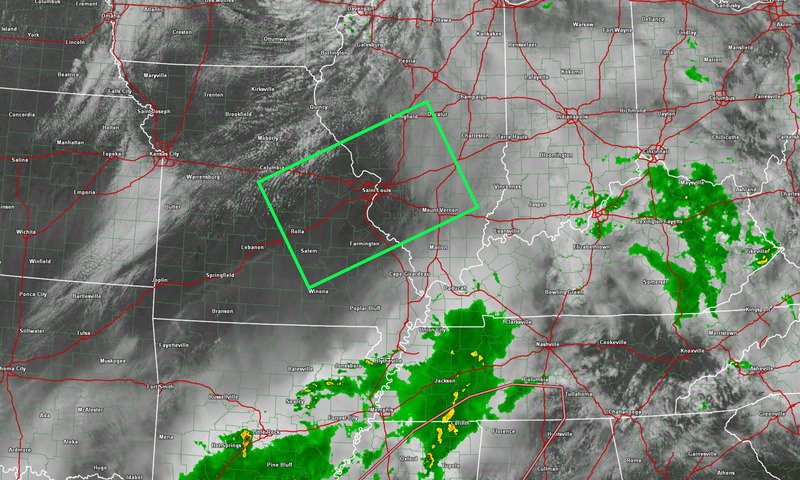 Keeping an eye on the green box zone between 4 PM and 8 PM for new thunderstorm development. Storms would then move east and northeast. Some of the storms could be intense with hail and wind. The Missouri Bootheel into parts of western Kentucky and western Tennessee will continue to have on/off showers and storms this afternoon (see live radars for that). The rest of the area will have to monitor for new storm development later tonight as a stronger impulse moves into the area. Today: Yes. Thunderstorms on Sunday and Sunday night could be intense. A few storms could become severe. There remain questions about coverage and instability. Confidence in storms producing quarter size hail or larger and/or 60 mph wind gusts is low. There is a non-zero tornado risk, as well. Low-end risk. Tomorrow: No. Lightning is possible. Is lightning in the forecast? Yes. Lightning is possible today into Monday. Is severe weather in the forecast? Possible. 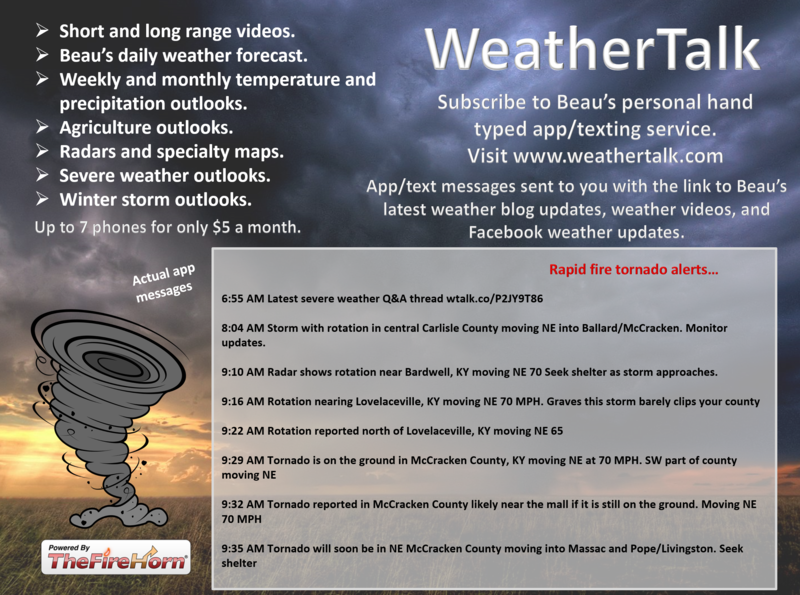 Some storms could be severe today and tonight. The main concern is hail and strong winds. Is lightning in the forecast? Yes. Lightning is possible on Thursday/Thursday evening. Is severe weather in the forecast? Possible. 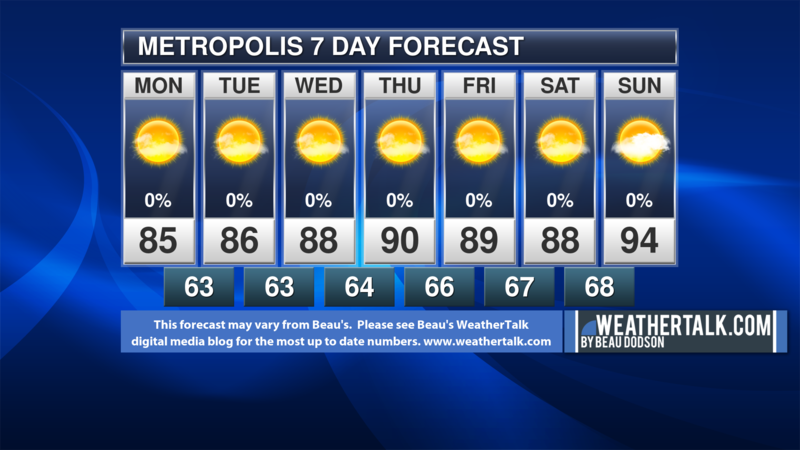 I am monitoring Thursday afternoon and Thursday evening. A cold front will push through the region. If we have enough moisture return then storms could be severe. Sunday’s Forecast: Windy. Warm. Temps will vary based on clouds and rain. A mix of sun and clouds. Scattered showers and thunderstorms. Much of southeast Missouri and southern Illinois may be dry today. Storms may develop in those areas this afternoon. 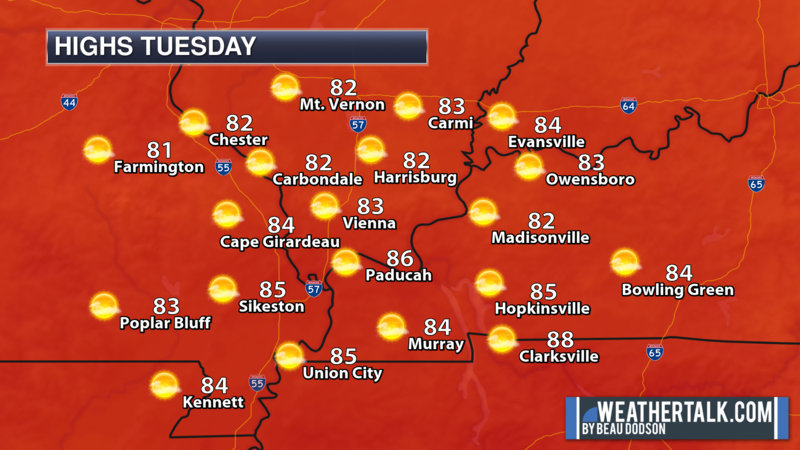 Extreme southern Illinois, western Kentucky, western Tennessee, and the Missouri Bootheel will have the best chance of showers and thunderstorms into the afternoon hours. A few storms could be intense with strong winds and hail. A low-end tornado risk. Should I cancel my outdoor plans? I would have a plan B but not cancel. Monitor radars. Sunday night Forecast: Cloudy with scattered showers and thunderstorms developing. The greatest coverage may be late tonight. Locally heavy rain is possible. Some storms could be intense. Monitor updates. Coverage of precipitation: Scattered to perhaps numerous. Greatest coverage may be late tonight. What impacts are anticipated from the weather? Wet roadways. Lightning. A few storms could produce hail and high winds. The tornado risk is low. Monitor updates. Should I cancel my outdoor plans? I would not cancel. I would monitor updates and radars. Monday’s Forecast: Quite a few clouds. Scattered showers and some thunderstorms. Thunderstorm chances will taper as we move through the day. Monday night Forecast: Decreasing clouds. Cool. Patchy fog. Thursday: A mix of sun and clouds. Warm. Windy. A chance of a thunderstorm during the afternoon. Mild. Highs in the lower to middle 70’s. Lows in the upper 30’s to middle 40’s. South and southwest winds at 25 to 40 mph. Winds becoming west overnight. Gusty. Friday: Partly cloudy. Cooler. Monitor the risk of frost Friday night if winds calm down. 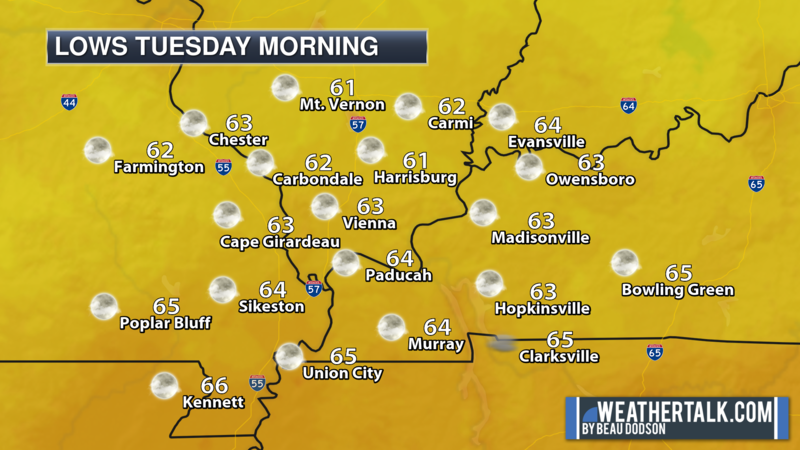 Highs in the lower to middle 60’s. Lows in the middle 30’s. West and northwest at 10 to 20. Gusty. Today and tomorrow: Thunderstorms are possible today and tonight. 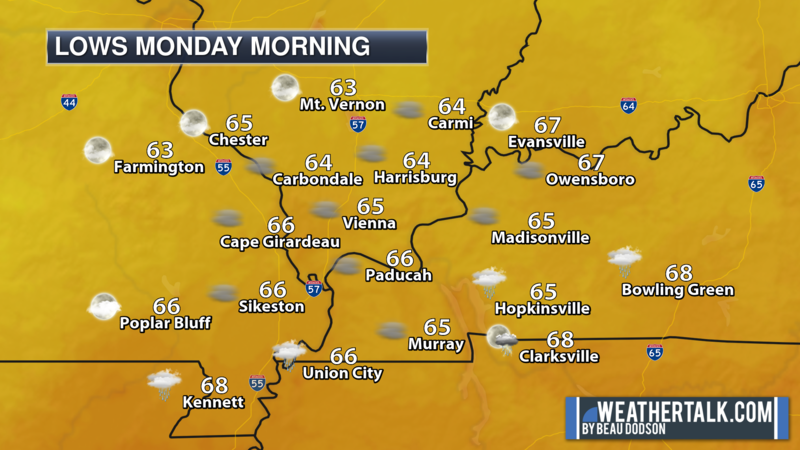 Greatest coverage into the early afternoon will be from the Missouri Bootheel into Kentucky and Tennessee. Later this afternoon some storms may develop in southeast Missouri and southern Illinois. Some storms today could produce strong winds and hail. There is a low-end severe thunderstorm risk. There remain questions about how unstable the atmosphere will become later today and tonight. Monitor updates. A few warnings can’t be ruled out. The tornado risk is non-zero. Low. Tuesday through Saturday: Thunderstorms are possible on Thursday (prob afternoon). Monitor updates. Some storms could be intense. Much warmer Tuesday into Thursday. A strong cold front arrives on Thursday afternoon and night. Some storms are possible. Much cooler behind the front. Chilly Thursday and Friday night. I am monitoring the frost risk. Winds may be too strong for frost Thursday night. Yes. Thunderstorms are possible today tonight. A few of the storms could be quite intense with strong winds and hail. Lightning, of course. Locally heavy downpours where storms occur. A few storms could become severe. Monitor updates. There is a low-end severe weather risk into tonight. A few reports of high winds and hail are possible. Lightning, of course. Locally heavy downpours. The tornado risk is non-zero. Low. As of 10 AM, showers and locally heavy thunderstorms dot the radar across the Missouri Bootheel into extreme southern Illinois, western Kentucky, and Tennessee. The greatest coverage has been across the southern half of the region. 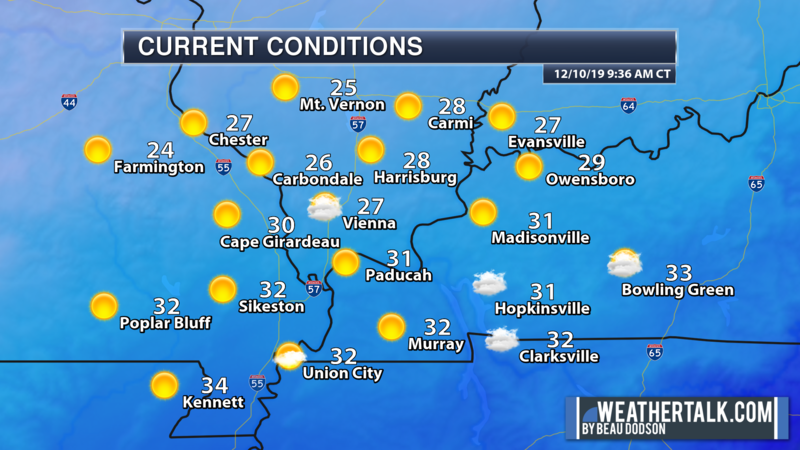 Much of today may be dry across southeast Missouri and southern Illinois. If the clouds clear then instability will increase. CAPE will increase. CAPE is a measure of energy in the atmosphere for thunderstorms to tap into. If storms redevelop this afternoon then they could be intense. 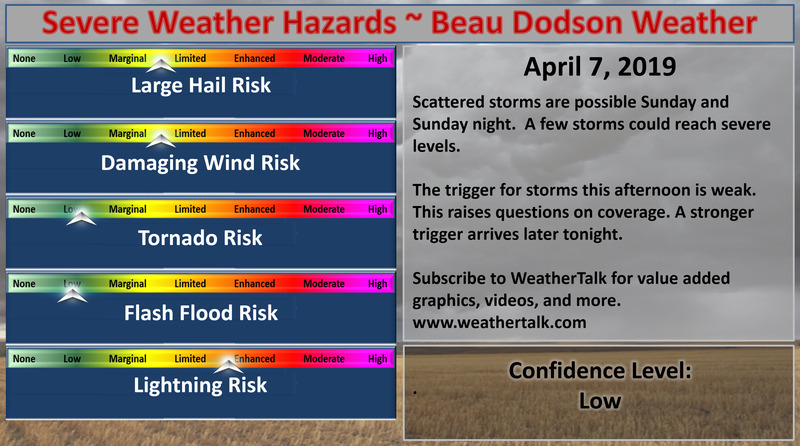 My greatest concern is across southeast Missouri and southern Illinois late this afternoon into this evening. This is the time-frame where the atmosphere will be the most unstable. The trigger, however, for storms this afternoon is weak. There is the possibility that little or no thunderstorm activity develops until this evening and tonight (across southeast Missouri and southern Illinois). Tonight is when a stronger trigger arrives. 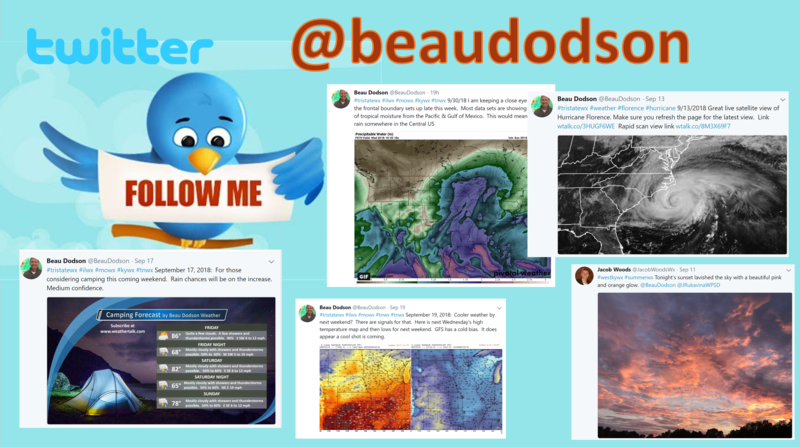 The best advice today is to go about your business and monitor updates and radars. I will send out app/text messages if necessary. 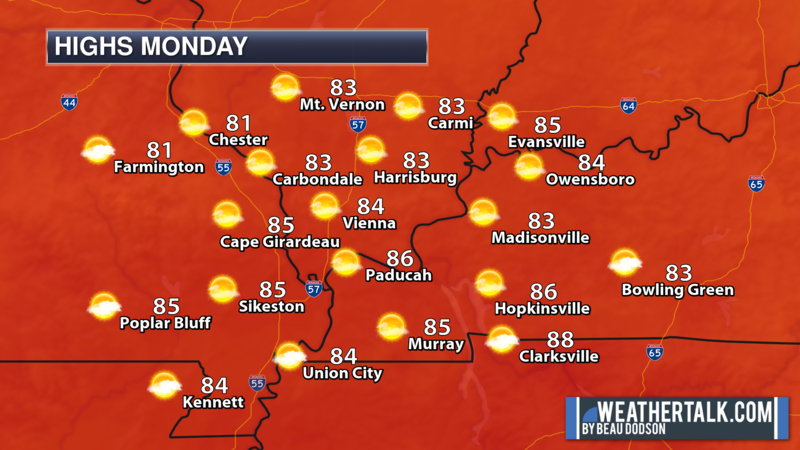 A few showers and thunderstorms will be possible on Monday, as well. This will occur as a cold front moves across the region. The precipitation will end by Monday night. Tuesday into Thursday morning will be dry. Much warmer, as well. A powerful winter storm will take shape by Wednesday night and Thursday well to our west and north. Here is that system depicted by the GFS model. There are questions about quality moisture return. This is a deep low and we should see at least some moisture return. Monitor updates. Some storms could be intense. You can see the line of showers and thunderstorms developing over our region on Thursday afternoon and evening. I am monitoring the risk of frost by Friday or Saturday morning. It may be too windy on Friday morning for frost to form. Winds would be weaker on Friday night/Saturday morning. Here are some of the forecast models for today and tonight. Notice how portions of the region remain dry for most of today? That is a good possibility. We will need to wait until a trigger arrives in order for new storms to form. 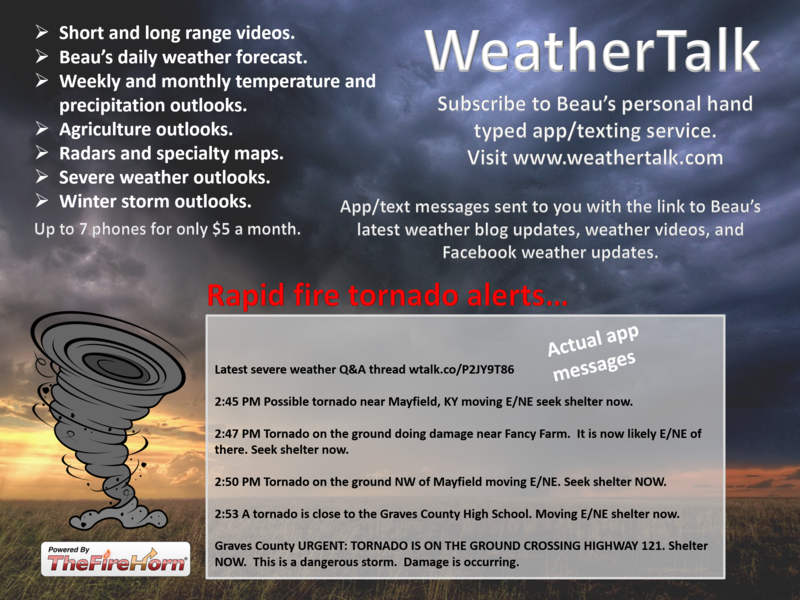 This is especially true across much of southeast Missouri and southern Illinois. If storms to form they could be locally intense.